Zeng performs her third routine with a ribbon, finishing with a score of 16.825. On a fateful Friday not long ago, a 16-year-old rhythmic gymnast stepped onto the mat in Rio de Janeiro, Brazil. Almost 10 years of training led to this moment and the crowd — both in the arena as well as classrooms throughout Libertyville High School back home — were silent, anxiously awaiting for her to perform. Some may know this gymnast as Laura Zeng, LHS junior, while others simply recognize her as a teenage girl with a crazy amount of talent and a knack for bringing home titles. Since the young age of 7, Zeng has been involved in rhythmic gymnastics, and in the past month, was able to fulfil her dream of performing in the 2016 Olympic Games. Rhythmic gymnastics was not always something that Zeng was a part of. Before she started the sport at North Shore Rhythmics in Glenview, Zeng participated in Chinese dancing at her Chinese school. Zeng initially got into rhythmic gymnastics when her friend, who participated in both Chinese dancing and rhythmic gymnastics, introduced her to the sport. “(Rhythmic gymnastics) has become a part of who I am. And honestly, it’s one of the most photogenic sports, I think,” Zeng said, regarding why she loves the sport and why she stuck with it all these years. It wasn’t long until Zeng started competing, and winning. Although the Olympics were always a dream in hindsight for Zeng, she never thought of them as an attainable goal until later in her career. She competed in many local competitions throughout the U.S. and later qualified for the Youth Olympics in China in 2014. Shortly after, in September 2015, Zeng competed in the World Championships in Stuttgart, Germany, where she qualified for the 2016 Rio Olympics. After scoring 8th place in the 2015 World Championships, Team USA’s highest score for an individual, Zeng qualified for a spot on the United States rhythmic gymnastic team. Because of her victory, the United States’ group of rhythmic gymnasts qualified for the Olympics for only the second time in history. The last time that the rhythmics gymnastics group qualified was in 1996, when the Olympics were hosted in Atlanta and the team earned a spot for the courtesy of hosting. Zeng’s commitment and dedication is not only evident through her performances and titles that she earns but is also recognized by her peers. “Laura has an incredible ability to focus. Any successful athlete needs to turn on a super high level of focus for training and competition, and Laura is especially good at doing that. In the gym, whether she’s practicing or competing, she is very efficient and seems like she’s thinking only about gymnastics,” said Jasmine Kerber, a former teammate and current friend of Zeng’s. After learning that she qualified for Rio, Zeng got straight to work on practicing her routines and preparing for the trip. Since the Olympics were at the end of summer, Zeng used all the time that she had to double-up on her usual practice regiment, travel to Russia to train, and attend local and national competitions to perfect her four performances at the Olympics. Before her actual trip to Rio, Zeng did spent numerous days packing and making sure she had everything together for the journey. Team USA also invited all of its athletes to make a 24-48 hour stop in Houston, Texas, on their way to Rio de Janeiro. There, athletes were able to get official pictures taken, uniforms tailored, and any answers to questions they had before making the journey to Rio. Team USA also worked with companies such as Nike and Ralph Lauren to provide athletes with clothing from casual sweats to formal medal-ceremony outfits. On August 13, Zeng was off, taking the 13-hour plane ride to Rio de Janeiro. While in Rio, Zeng stayed in “The Village,” which was a community where all of the Olympic athletes and their coaches resided during the games. The village was equipped with numerous gyms and cafeterias available for all athletes to use. In her free time when she was not practicing, Zeng was able to walk around the village, socialize with other athletes and trade pins with them from their countries. She was able to meet some of her favorite Olympians including; Team USA pole vaulter Sam Kendricks, Team USA diver Steel Johnson, and Team Guyana track runner Aliyah Abrams and many others. Zeng also visited the “Christ the Redeemer” statue, tried an acai bowl, and visited her parents at the P&G house — where families of Team USA Olympians stayed. “Before, there’s a lot going on. I was of course just so grateful to be there, and the whole Rio experience was just amazing: Getting to live in the village, getting to compete at such a big stadium with such a huge crowd. There’s definitely a lot going on, so before and after, it was my goal to take it all in,” she said. However, it wasn’t all fun and games. Zeng had four routines to perform on Friday, Aug. 19. Using her four pieces of equipment — ball, hoop ribbon and clubs — Zeng spent the entirety of that Friday performing, hoping to win a spot to compete in the finals. Zeng’s opening routine, using a one-pound red/pink ball, was a minute-and-30-second series of turns and flips, while throwing the ball into the air and catching it. Zeng was consistently leaping and moving across the floor as she threw the ball into the air and relocated to catch it. She also had moments throughout the routine where the ball would be held by her neck or roll smoothly across the span of her arms. Zeng received a score of 17.6666 on this performance. 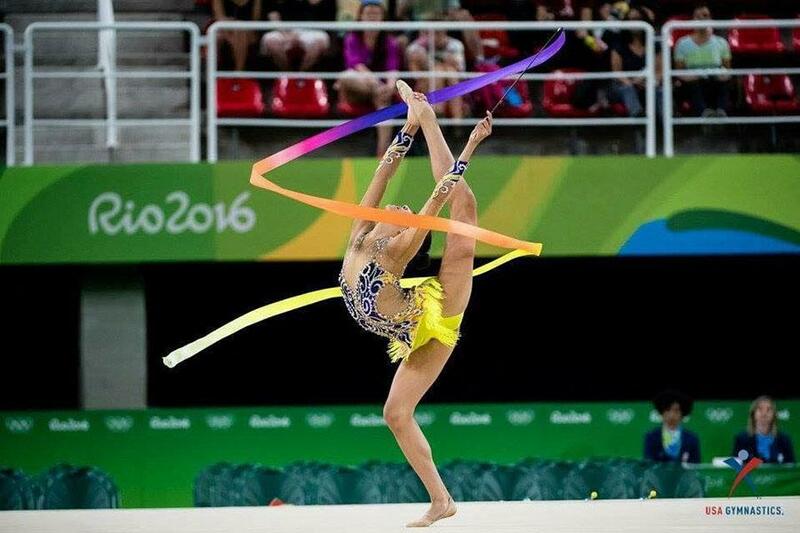 Using a multi-colored hula hoop, Zeng moved along to perform her second routine. Throughout this one, she was constantly throwing the hoop in the air with her hands and feet, catching it with her arms and legs, and she also put the hoop around herself several times while performing flips, balances, and turns. At the end of her routine, Zeng flicked the hoop away from her, and when it spun back towards her, she kicked it into the air and caught it with her hands for a strong finish. She finished this routine with a score of 17.650. For her third routine, Zeng used a purple, yellow, and orange ribbon in a captivating and energetic performance. She performed a series of tilts and other balances and movements, while continuously circling her ribbon in various patterns. Zeng also threw the ribbon into the air and across the floor a few times, twirling and flipping to the other side of the mat to catch it. With an unplanned drop of the ribbon at the end of her routine, she scored a 16.825. For Zeng’s fourth and final performance, she used two striped clubs. Throughout this routine, Zeng spun and juggled the two clubs while performing series of balances, leaps, and flips across the mat. She finished the routine by throwing one club into the air, getting down to floor level to perform a few flips, and catching the club. And her score of 17.700 proved that Zeng did perform the best in her final routine. Zeng ended up finishing in 11th place overall, meeting the previous U.S. rhythmic gymnastics Olympic record. She just shy of placing 10th and qualifying for the final round. However, she is not letting her placement hold her back. For many people, measuring up to the Olympics might seem daunting, but not for Zeng. Next year, Zeng hopes to compete in the World Games, which will be held in Wroclaw, Poland. She also hopes to be able to go to Tokyo in 2020 for the next Summer Olympics. As of right now, though, Zeng’s primary focus will be catching up on academics and the near future, graduating from LHS in 2018. “I’ve spent the last two weeks working hard and [going to sleep] at 3 a.m. (even without practice then), but it’s all good. I’ve caught up to all my classes now, except for AP Physics,” said Zeng. But now, Zeng is heading back to her daily 3-4 hour practices and dealing with the weight of her junior year while also continuing her journey as an Olympic athlete.